Mall of Georgia Ford invites you to review the data on the new 2013 Ford F-150 in Atlanta. We understand that Atlanta and Buford, GA, drivers demand top performance and economic operation from Ford trucks, and the new 2013 F-150 delivers! With a base V6 3.7-liter, 302-horse-power engine and 17/23 mpg rating, it's no wonder Ford F-150 is an Atlanta top-selling truck. F-150 proves itself as a work vehicle with a 3,120-pound payload and 11,300-pound towing capacity. When it's time for family recreational activities, you'll be happy to learn about F-150's Safety Canopy System® and AdvanceTrac®: Ford technology designed to help keep your loved ones safe on the road in Gwinnett County. Once you've reviewed the information below, be sure to contact us at Mall of Georgia Ford in Buford, Georgia, where we're ready to explain all the options available to Atlanta-area Ford F-150 shoppers. Check out the 2013 Ford F-150 head-to-head with versus similar autos like the 2013 Nissan Titan, Chevrolet Silverado, Dodge Ram and the Toyota Tundra, and you will spot that the 2013 F-150 transcends those vehicles in various areas. Scan the reasons see why! Ford F-150 owners won't get the same fantastic factory-trained Ford mechanics and real Ford parts at a independent service company. But at our Atlanta dealership you'll have access to this consistently, along with the joy that comes with having a 12-month service warranty. The esteemed technicians at our Ford repair center in Atlanta will help your F-150 run at its peak. For routine oil changes and other Ford services like timing belt maintenances and wiper blade replacement, come to us. We even handle more time consuming projects with no trouble, including jobs like muffler repair. For quality Ford repair in Atlanta, drive your F-150 to Mall of Georgia, where you can plan on getting great service. Find out how much you can save on your next service! Just follow the link below. Look to Mall of Georgia Ford for your 2013 F-150 Ford Truck in Atlanta. 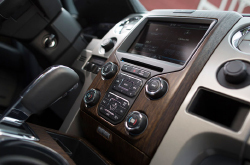 After watching the video review and seeing the stats on the new 2013 Ford F-150, you'll be asking yourself which package best suits your lifestyle. Atlanta drivers like F-150's selection of models designed to fit both work and play-time activities. 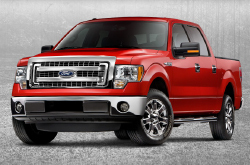 We'd like to show you the differences in models like the Ford F-150 STX, XL or the F-150 XLT. We'll help you determine which engine, ranging from a 3.7-liter V6 to a 6.2-liter V8, best meets your power needs. Other decisions involve seating choices between Regular, Super or SuperCrew cabs and box sizes. Technology options abound with SYNC® for hands-free voice-activated control of communications and entertainment systems, and an onboard Navigation System with SiriusXM Traffic and Travel Link. At Mall of Georgia Ford, you'll get the personalized service you need to make an informed truck purchase; additionally, our finance department is dedicated to making it all happen within your budget. Take a ride to Mall of Georgia Ford in Buford, GA, to test-drive a new 2013 Ford F-150 today.